Enter your Frito Lay code and you could win 1 of over 2,000 Cabela’s gift cards. Perfect for Fall or even holiday shopping. Eligibility: Open only to individuals who are residents of one of the 50 United States or the District of Columbia and are 18 years of age or older. Entry Dates: Begins on October 10, 2010 and ends at 11:59:59 p.m. CT on December 4, 2010 or when supplies are exhausted, whichever event occurs first. Without Purchase: If you do not have a Game Code, you may generate a free Game Code on the Web Site (defined below) by following the online instructions. Text: Use your mobile phone to text “Gear Up” to shortcode 65579. You will receive a reply message requesting you to text your Game Code exactly as it appears on the package or at the website. 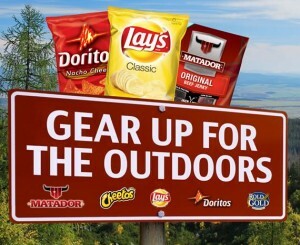 Online: Visit www.fritolayoutdoorgearup.com and click on the icon, banner or text link to access the Game page. Follow the on-screen instructions to input the Game Code. Free Codes: You can get a free code on their website. Just click Generate Code. Entry Limit: One play per day per person/email address/phone number. (150) Grand Prizes: A $100.00 Cabela’s gift card. (300) First Prizes: A $50.00 Cabela’s gift card. (2,000) Second Prizes: A $10.00 Cabela’s gift card. Just was blessed by winning a $100 to Cabelas…my birthday is gift early and my husband is excited, too! Just won a $50 Cabela’s gift card! I just won the 10 gift card. I entered my code and it said I would be emailed the gift card within 10 business days. Just won a $50 GC! Yay! Grrr…. I’m trying to redeem for my prize, but it says the code is invalid or expired, what gives??!?! Just won a $10 GC a few min ago and got the same error message. I called the 1-800# and they said a rep will look into it. When I won I was super frustrated, and tried and tried and tried. I called the 800 number but it was after business hours. I usually use Google Chrome, and decided to try the form in Internet Explorer, and it worked on the first try. I don’t know if it was a fluke or a fix but I will take it! Does anyone know if you can win MORE than once? I was looking at the official rules and I don’t see any limitations for that? only to PLAY it once per day. Wanted to know if can WIN more than once… I DID win the $10 Cabella gift card… but had the SAME problem a few of you had with it saying that the code had expired or was used.. I DID call the 800 number and they said they would fwd. the issue on. So, hope to still be able to use it! Hmm was so excited about winning the $10.00 until I read all the comments. Finally won a $10 gc! Winners…how long it is taking for you to get your prizes? When I submitted the online confirmation form it said I would get it via email within 10 days, but it has been about 2 weeks and nothing. I won on 10/28 & haven’t received anything. Crazy timing, but just got an email with the gift card code this am. My favorite way to eat fritos is with chiLi cheese did. its soooo good! just had it earlier as a matter of fact…….. Cool! I won the $10 GC tonight. I had some trouble entering the info, but finally got it to work. Just got my email code for my $50 giftcard! I won near the begining of Nov so it takes awhile.